I wonder whether people in Singapore still remember that the A & W Restaurant once operated in Singapore. In fact it is the first fast food restaurant in this country. The first store was opened in 1966 – that was a long time ago. In those good old days, long before MacDonald, KFC and Burger King came into the picture, it is the most favorite restaurant among the teens. It was cool to be hanging out in A & W restaurant, having your favorite frosted root beer and a burger. Unfortunately the A & W restaurant closed its operation in Singapore in the year 2003. That was sad because it spell the end of a historical fast food restaurant and good frosted root beer. I love the A & W root beer. It is really my favorite beverage. You can drink it in its original form or you can add the extra punch with the topping of your favorite ice-cream. Every time when I am in Indonesia or Malaysia, I will make a point to go down to a A & W restaurant to enjoy the cold root beer. In Indonesia, you can find A & W restaurants almost in all major malls. I guess this restaurant is very popular among the Indonesians. 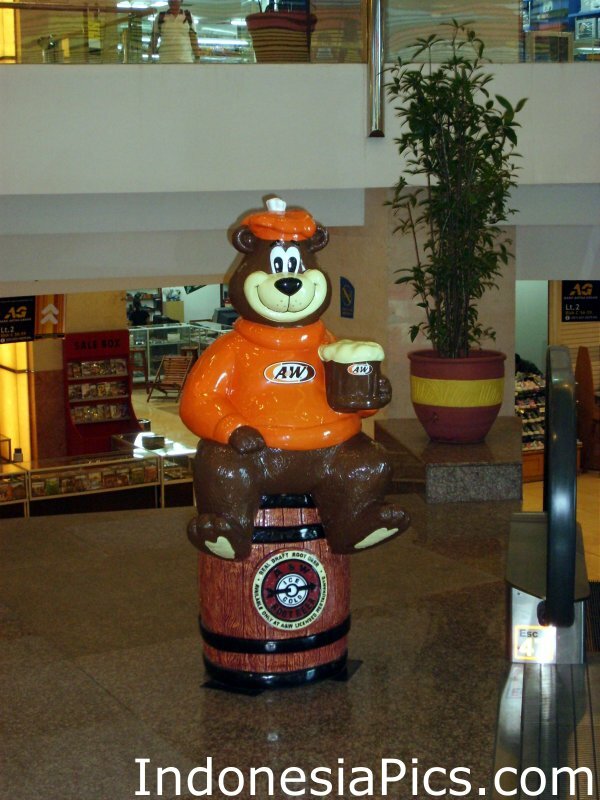 In some malls, you can see the mascot of A & W restaurant – which is the famous Root Beer Bear sitting prominently outside the entrance of a mall. This is a good marketing tactic, for it means that this restaurant is just nearby. Also in Indonesia, the A & W restaurant serve rice as part of its menu. You can take it with the fried chicken which is very crispy. I guess the reason why the restaurant serve rice is because rice is a staple food in Indonesia. Don’t worry if you do not like rice, because they do have their regular burgers as well. 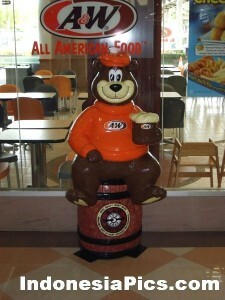 I wish that A & W restaurant can open up its restaurants in Singapore again. I am sure that there many pople in Singapore will love to see it come back. Perhaps the operator could follow the success plans and operations of their counterpart in Indonesia. Perhaps they can also try serving rice with fried chicken which is a core menu in the restaurant. But I do know one thing is for sure, if they do open up a A & W restaurant in Singapore, I will be there – for the original best root beer.